Fisker Automotive, founded by auto designer Henrik Fisker, began making the $88,000 rechargeable Karma sports car in Finland in March. 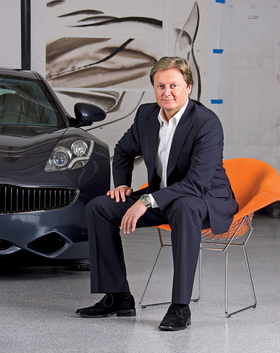 LOS ANGELES -- Fisker Automotive Inc., which is producing its luxury plug-in hybrid sports cars in Finland, is raising an additional $100 million as the startup company prepares to deliver its first production vehicles to retail customers. Fisker disclosed the additional funds today in a filing with the U.S. Securities and Exchange Commission, without identifying the investors. The company, based in Irvine, California, completed a $190 million financing round in March. The company, founded by auto designer Henrik Fisker, began making the $88,000 rechargeable Karma sports car in March at Valmet Automotive Oy's plant in Uusikaupunki. Full production of the vehicle, capable of traveling 50 miles (about 80km) solely on electricity before a gasoline engines powers the wheels, is set to begin after the first 3,000 customers receive their cars. Roger Ormisher, a company spokesman, didn't immediately return a call seeking comment.